1. 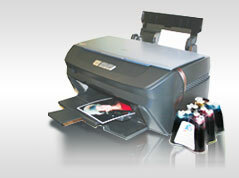 Everybody knows that printing using compatible consumables is cheaper, than with original cartridges. However not everyone is aware that printing on the jet printer with СISS is less expensive, even compared to a laser printer. Not to mention comparison with original cartridges – approximately 20-30 times cheaper, or 1000-1500 % economy. Speaking about color printing, cost of color jet printer begins from US$50, but a color laser printer costs several times more. 2. Economy in comparison with use of original cartridges constitutes 1000-1500 %, or 20-30 times! Printer manufacturers intinionally set low prices on printers, and then sell cartridges at high prices! After all, you do not have possibility to purchase cartridges of another manufacturer after printer purchase. Printer manufcturers earn 90 % of profits on sale of cartridges. Are you able to calculate how much you overpay? By using compatible consumables the cost of one print decreases by 20-30 times. Or compare cost of ink (100 ml), knowing that in a usual cartridge there is 8 ml of ink, 2 ml the printer technically cannot extend, in total you have 6ml of ink. 3. Using the jet printer with CISS, you receive a set of new possibilities which will help you find new and improve relations with existing clients. • You need to print 200-300 color booklets with different contents, but offset printing companies print only large orders or ask for astronomical cost? • Do you want to make color business cards quickly? • It is necessary to print color price lists and presentations for clients? • There is a necessity to print photos, images, visualization, schemes or diagrams in full color and for reasonable price? It is only a small part of all possibilities of the jet printer. Using CISS, the costs for each print decrease by 20-30 times! For example, the cost of a diagram on the page (А4 format) will cost 0, 01 cents!